I do not possess near the experience or writing ability of most here, but I'll share my thoughts on my recent experience with the Takamura R2. On a "bucket list" thread on the forum I mentioned that I would like to try out one of the knives oft referred to as a "laser". For some unknown reason, Lepus reached out and offered to send me one to try out; this was completely unexpected and a bit stunning so I took him up on the kind offer. To be transparent, I have little point of reference of which to compare this to but I'll do my best. When I opened the box I was amazed at how light it was, compared to what I know it almost seemed like a toy. This illusion all ended when I touched the edge, holy sweet Jesus this thing is large, light, and sharp. I just could not believe how well it fit in my hand. The space between the choil and the blade allowed me to hold it in a manner like I have never felt before- this is just like an extension of my hand. I immediately found some things to cut, celery, apple, and chicken, it quickly became apparent (or seemed) to me that what I was holding was a very large razor blade. Because it wasn't my knife I found myself being very careful because I did not want to chip it and didn't have any reference into how durable just a thin blade really is. I found myself wondering what such a tool is really used for. Although I somewhat understand from reading this forum extensively, putting it into action was a different story. Over a few days I found things to slice up while being careful to never hit the cutting board. I did find great joy in slicing up an entire apple into paper thin slices, and this knife would do the same with anything put under it. I did learn that the cladding is different than anything I have experienced, softer than the knives I am used to as evidenced by taking a scotch brite pad to it which polished it instead of cleaning it up, but that's another story all together. Lepus, encouraged me to sharpen it so I did my best. 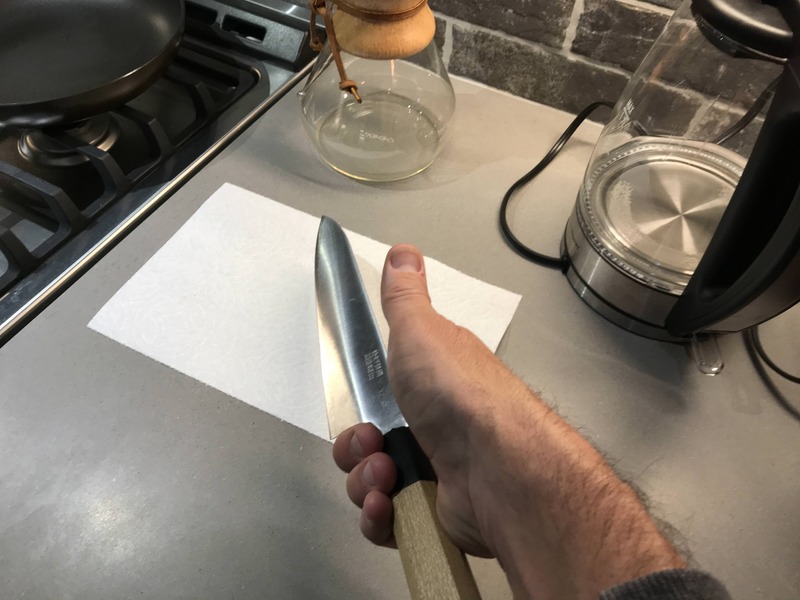 Being careful to not remove any steel, I ran it over Chosera 1k, then Shapton Glass 4k and the edge was simply ridiculous; I could could easily shave with it if the blade wasn't so large that a mistake would cause me to cut my face off. Well thank you Lepus for allowing me to gain some insight into what you are all so enthusiastic about here. My Euro blades and less expensive Jknives will never feel the same. I owe you one, and my memory is long. Great write up Jason! I also had similar feelings when I picked one up early in my collection and, many knives later, I still love it. It's still one of my go to knives for detailed work. Welcome to the world of lasers man! I see you got the hot-rodded version with the wa handle. I bet that sucker is light! Glad to see you enjoyed it. I'm tickled every time I use the one I bought for my parents several years ago. Fantastic blade. Nice! While not quite the same, I recently had a chance to use a Takamura R2 Migaki 210 mm gyuto with the best western handle fit and finish I have ever seen. Laser performance, of course. Looks like this goes on the wish list for me, or a new wa handled version. For reference this is the Takamura Tim modified for cedarhouse a few years ago. I have a serious soft spot for it. ^^^That's so nice to read. I have to admit I immediately thought of cedar's knife while reading the OP, and it was nice to find out it was his. I also always appreciate reading about older, used knives that are still go-to standards. Most of these knives are made by people who hope they last for decades, but on the forum we tend to spend much more time talking about what is new and much less time talking about our favorite knives that are five years or older. Tamaurma in a wa handle...what does that weigh, like 100 grams? Lol. Thank you for the write up! It's 128 grams. The handle is a bit larger than average and uses a hardwood body, though I don't know what of. It keeps the balance a hair behind a pinch grip. With a Konosuke handle I think it would be lighter than the Ashi lasers. My Ginga swings between 100-101 grams on my digital scale. It is freakishly light. My HD is 115 grams, but I think it is shorter than the Takamura (it is 203mm x 43mm). I actually like the (relatively) heavier handle a lot. I've used the smaller Ashi lasers and the shorter ones feel much smaller than this knife. Honestly I think the regular heavier Takamura feels perhaps a bit smaller, though I haven't used one for years and part of that may be acclimation. Part of that is the extra 10mm of length and 2mm of height, but the Takamura is even thinner than the Ginga and Konosukes. If the handle lost that last 10-15 grams of weight it would not feel as complete a package as it does. I agree. Joe and I have had this conversation a few times. The Ashi and Kono lasers in 210 feel more petty like than gyuto like. I'm glad you went there, Lepus—I mentioned the Kono weight in order that we might make this thread useful in another way. Lots of people talk about a Takamura Wa (and wanting one), but the reality is, I think it would result in a very different knife. The difference between my Kono 210 Wa and Yo is very, very significant, for example: different weights, the sense of different heights due to the thickness of the neck, different lengths (both Japanese lengths, so the Wa is measured from the handle and is therefore only 203mm on the edge, while the Yo is measured from heel and was therefore 212mm), different grips (the Wa offers a very different sense of "pinch" due to the bolster), different tip balance (the back-weight of the Yo make it much more authoritative in the rear, but less direct and more floaty at the tip), and different grinds (the Yo has a thicker grind, mainly because the thicker tang coming out of the Yo handle effects the distal taper all the way to the tip). And that is just the things that are easier to list...!! And I feel like a Takamura that came as a Wa would probably have similar differences. You get at this in your description already, but that is even with a "converted" knife that in fact would lack a few of the distinctions I would expect from a factory-designed knife. All food for thought, even when comparing the Takamura Yo with other Wa options.